Goa's sunset - the only thing missing from the picture is you. 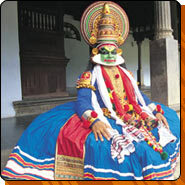 Traditional kathakali-dancer dancing in sotisova. Arrival in Kochi (Cochin), the meeting place of many cultures. Transportation to the hotel, Kathakali danceshow in the evening. Along the highway to Kumarakom, accommodation in a residential boat. A boat trip through lagoons towards Alleppey. Towards Periyar's wildlife sanctuary. A possibility to have ayurveda massage. Boat trip on Lake Periyar, observing its variety of wildlife. A walk in the sanctuary. Along the highway to Kovalam, where we rent the beach hotel of your choice. Arrival transport to the hotel. 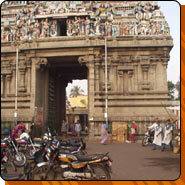 Tour of Bangalore. Car trip to Hassan. Hotel accommodation. Visit of the Belur temple. Morning visit of the Haledib temple. Car trip to Mysore through the countryside. Hotel accommodation. Car trip to Bangalore. Transport to the airport / railway station. The cost of the journey is 549 € (for at least two persons). Including: accommodation at tourist class hotels, tours and car transports. We can assist in bookings of Indian internal flights. Goa - Bangalore c. 100 € /one way.